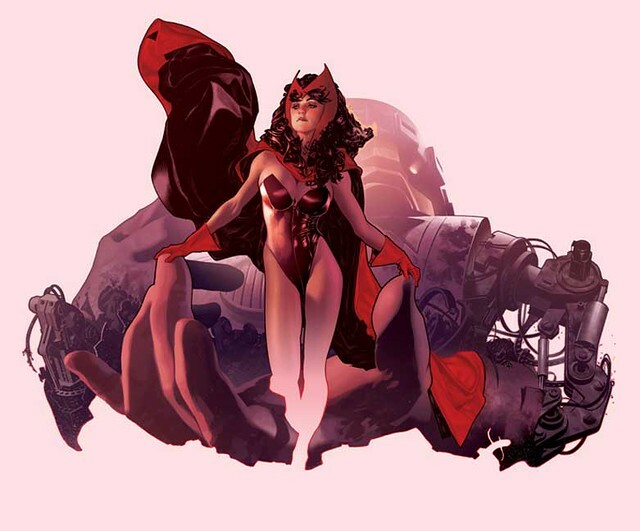 Here's an Adam Hughes illustration featuring the Scarlet Witch, from her more heroic days. She's looking very calm and collected after taking down that giant Sentinel. Nuff Said! That's stupendous, ta for sharing it. The angle of the battered Sentinel is great ... boy, I miss heroic Wanda, I hope she's back on the sane and narrow after the current Young Avengers mini. I hope for Wanda's return to the Marvel Universe as well. Not only Wanda, but I want my Vision restored as well!